Henry Sinsheimer was born to Simon and Claire Sinsheimer in 1855 in Burstadt, province of Daerstadt, Germany. Two of Henry’s brothers, Aaron (A.Z.) (b. 1838) and Bernhard (b. 1848), were also born in Burstadt. Henry Sinsheimer found his way to San Francisco in the mid-1870’s, where he was employed as a bookkeeper for Koshland Bros., wool merchants. 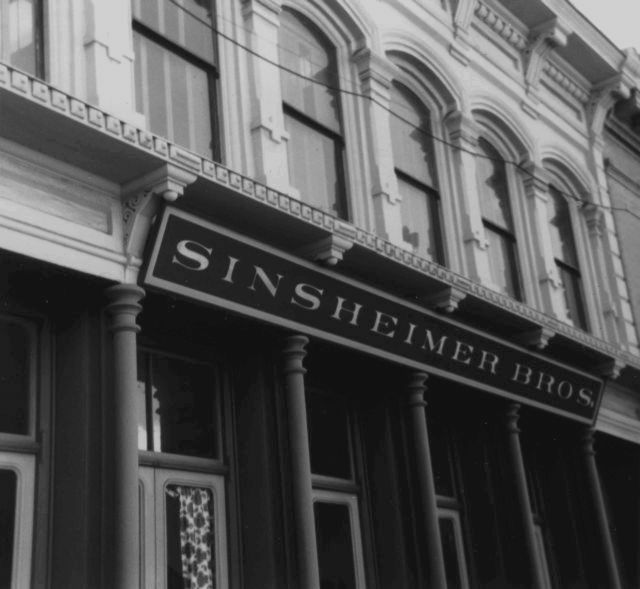 After his marriage to Nettie Koshland in 1881, Henry Sinsheimer became a “member of the firm” of S. Koshland & Company, and a leading figure in the San Francisco Jewish community. Henry’s older brother, Bernhard Sinsheimer, settled in San Luis Obispo, California, in 1874. Two years later, Bernhard and Henry created Sinsheimer Bros. General Merchandise in San Luis Obispo. Bernhard ran the business in San Luis Obispo, while Henry acted as its purchasing agent in San Francisco. In 1884, the Sinsheimer brothers purchased a lot on the east side of Monterey Street at Rose Alley in San Louis Obispo. They built a brick store that was 40 feet wide and 100 feet in depth with a custom cast iron front. 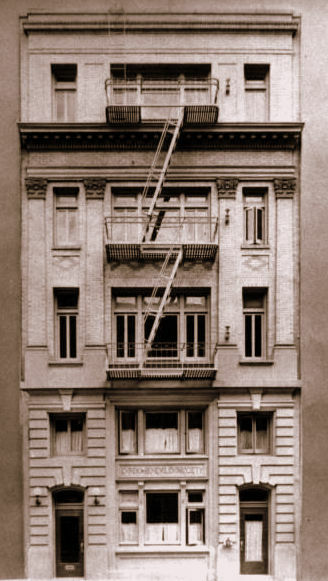 Today, the Sinsheimer store is regarded as one of the best-preserved iron-front structures in the nation. 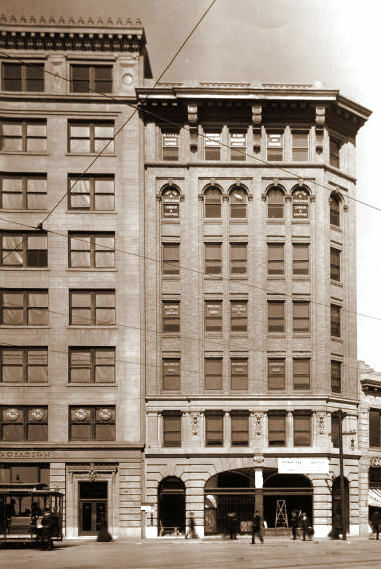 In 1898, Bernhard and Henry dissolved their San Luis Obispo partnership, and Bernhard moved up to San Francisco. A new corporation was started, again using the name Sinsheimer Bros., which was owned by their brother, Aaron (A.Z.) Sinsheimer, who had worked in the business for years. 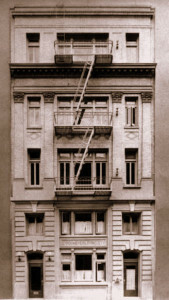 Henry Sinsheimer was a member of Congregation Emanu-El in San Francisco. He served as vice-president and then president of the Federation of Jewish Charities. He was also president of the Hebrew Board of Relief and served as president of the Eureka Benevolent Society for over a decade. 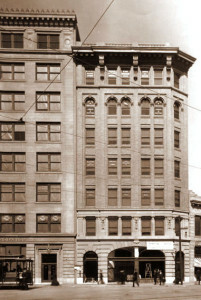 Henry Sinsheimer was a member of the Concordia Club. Henry Sinsheimer married Nettie Koshland in 1881. They had two sons: Stanley and Edgar. Henry Sinsheimer died, in 1932. In response to anti-German sentiment, his sons changed their last name to Stinson in 1917. Norton B. Stern and William M. Kramer, “The Sinsheimers of San Luis Obispo,” Western States Jewish Historical Quarterly 6/1. David Epstein is curator of this Henry Sinsheimer exhibit.